When I first started fly fishing for bass in the early 80s I tied and fished these a lot with very good success. Somewhere along the way I just quit using them. new patterns, new materials come along and old tried and true patterns are forgotten. Recently Ive been trying furled worms which are new to me and they got me thinking about Daves eel worm streamer again. So I whipped one up real quick. Anybody else still use and fish this pattern? This is small one on an Allen B200 14. I just tied some very similar to try out. Some in gray/red and some in olive. Gonna have to try some in purple, too, I think. I never had much luck with the bubblegum colored stuff. Probably operator error because everyone else seemed to do pretty well with it. I think I might try to do some furled worms with pink dubbing, though, because I dont have any other use for it. Here is a real one..Black eye lash yarn for the body , 8 hackles hanging off the back with some black and gold Krystal flash. Tied on Owner straight 3/0 worm hook. 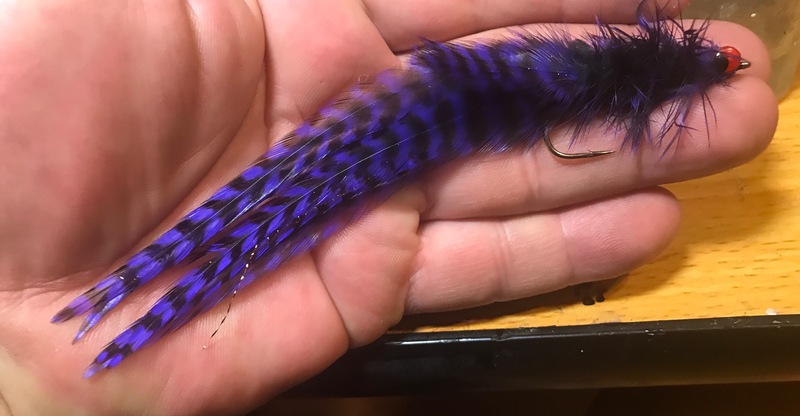 That looks like an old pattern I tied years ago called a "Serpent Fly"
Yep pretty much the same thing. I remember why I quit tying them now,they will eat up a saddle patch real quick. Working on a olive one tonight.